While slowly digesting last nights humongous christmas dinner, I thought I'd look back on this years output of miniatures. In 2015 my hobby mojo have oscillated wildly and during the fall I took my first (and much needed) long break from modelling since the conception of this blog. Despite this almost three month hiatus I still managed to crank out a total of exactly 30 painted conversions (of which three are much bigger models than my usual fare). Not too shabby all things considered. The year started in the sign of papa Nurgle with a small chaos warband led by the ignominious Mawgut Gloop. It was a lot of fun going back to Warhammer Fantasy and taking cues from the old Realm of Chaos books. Later this year I also did a Tzeentchean champion. Meanwhile in the world of the 41st millenium, the release of the Adeptus Mechanicus was the biggest event - and the stellar new kits have had a huge influence on most of my models with round bases. 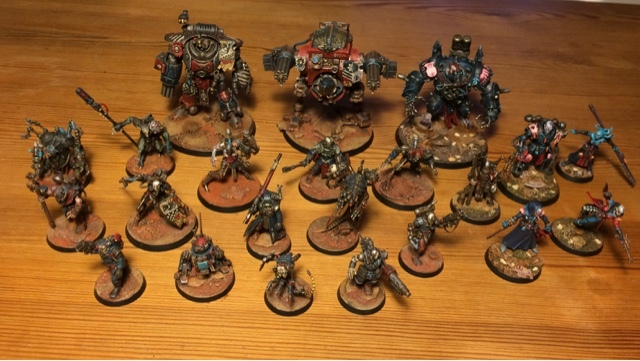 I've built a pretty large mechanicus warband (at least for inquisimunda) with two big robots, several smaller automatons, cyborgs, servitors and a rather nasty looking Magos. Recently I've started work on a Dark Mechanicvm gang dedicated to Nurgle (obviously my favourite chaos god) repurposing some older models and building new ones. The year started with Slaanesh and harlequins though with the three models I made for the Iron Sleet Invitational. I've also made a few non-mechanicus imperial servants and two Xenos (which was my original idea for the Iron Sleet project). The plan for next year include more fantasy as me Alexander and Erik AKA Nordic will play a few realm of chaos inspired in february using the new Chaos Champion Warband rules for Age of Sigmar. More mechanicvm of course - both loyalist and traitorous (and somewhere in between). And with that I bid you all a Merry Christmas and a Happy New Year! Speaking of christmas I recieved a very special present from my buddy Kraut a few days ago. 30 models at this quality in only 9 months is quite good imo :) I did guess that you would be part of the big surprise so I must admit I'm rather excited by what you guys have in store! 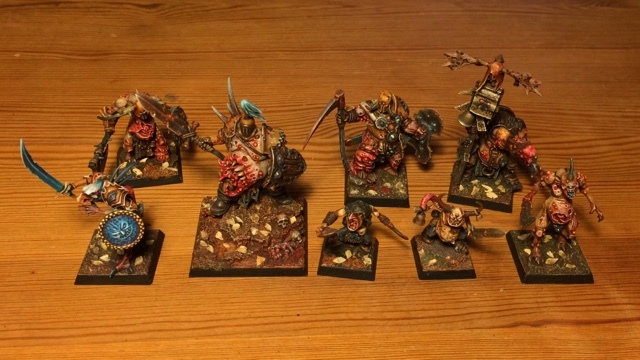 Btw, where are those Chaos Champion rules for AoS? Do you just need the first document you linked for this, or do you need the full "campaign bundle" thing? Seems like half of that is painting guides and the rest are missions maybe? Definitely interested in trying this myself if the full rules are contained in the first document only. The standard version for four quid should suffice. It's got all you need to roll up a warband and play a campaign. Thank you! Hope you get (and enjoy) the book! Another great year of modelling! 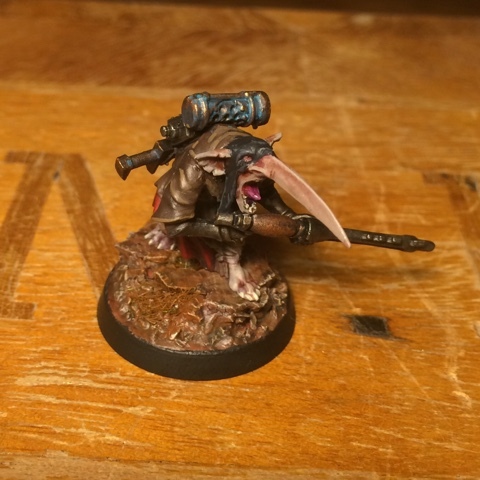 30 miniatures is really impressive, especially considering they are wonderfully converted! Your Tzeentchean champion is one of my favorite; I love his shield! Looking forward to seeing what you work on this year! I was so happy when Kraut sent that goblin over - it really is a perfect rendition of the sketch I made for him. Great stuff mate. Unbelievable looking back how much you've accomplished and the standard you set. Cracking good stuff. All the best for 2016. I humbly accept your accolades, Muppet. An other year with a lot of good stuff... I'm very please to see you're planing more fantasy goodies, can't wait to see ! Once angain, thank you for sharing your fantastic work. Cheers Manu! Happy new year!